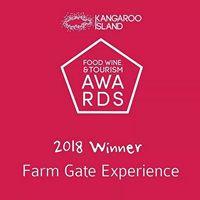 Emu Ridge is proud to have won the BEST FARM GATE EXPERIENCE 2017 at the Kangaroo Island Food, Wine & Tourism Awards on the 16th of June, for the second year running. Thanks to all our amazing staff for the wonderful job they do, our business wouldn’t be what it is without them. Congratulations to all the other winners, and finalists, we hear it was a fabulous night. 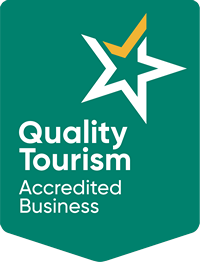 Well done to all involved & thanks SeaLink Kangaroo Island the sponsors of this category. We thank Melissa & Ella for representing us, we were away on holidays! 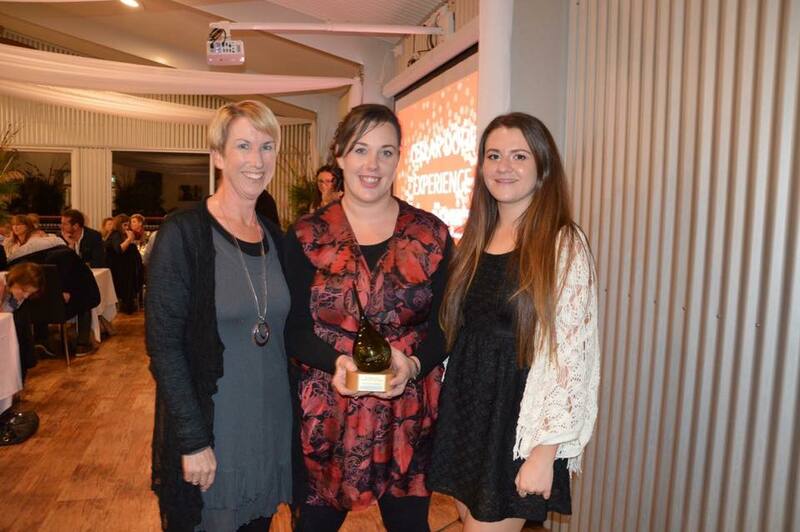 The annual Food, Wine and Tourism Awards were held at Dudley Cellar Door. Guests enjoyed an exquisite menu prepared by Chef Marion Trethewey of St Austell Farm, featuring authentic local produce, accompanied by a wide range of local beer, wine, and spirits. The Minister for Agriculture, Food and Fisheries and the Minister for Tourism, The Hon. Leon Bignell MP was the keynote speaker on the night. “Kangaroo Island offers some of Australia’s best culinary tourism experiences, and these awards recognise and celebrate everyone who works in the food, beverage and tourism sectors on Kangaroo Island,” Minister Bignell said. See this link for Emu Ridge images and this one to the nights action and this link takes you to the other proud winners images. 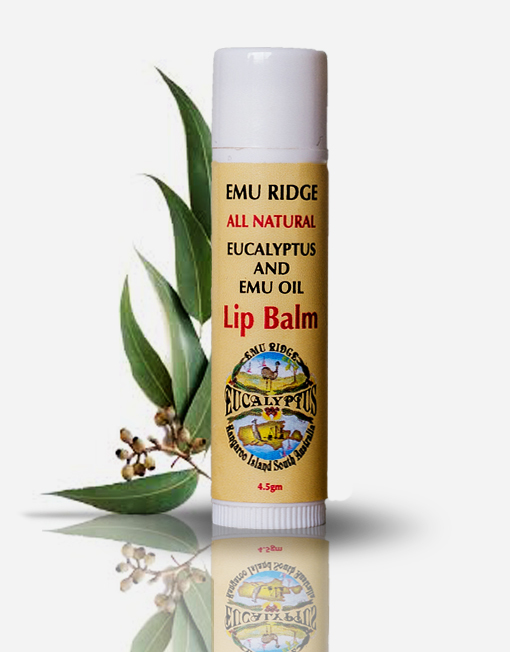 Emu Ridge Eucalyptus is the real deal, a “very rustic regional Australian venue” according to the category judges. 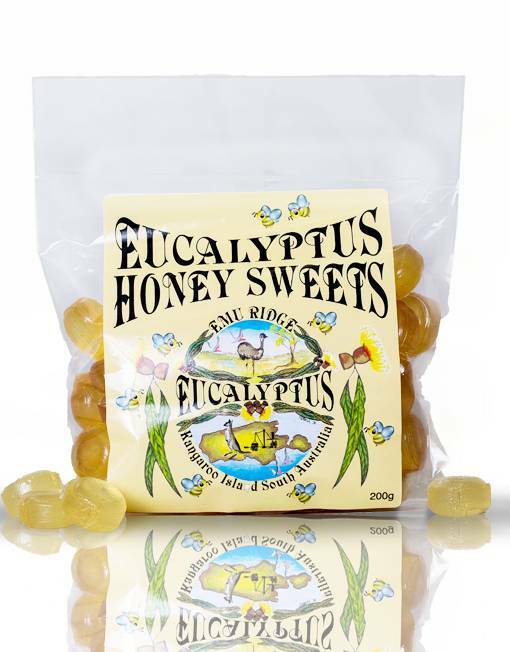 Emu Ridge is the only commercial eucalyptus distillery in South Australia, a pioneer in sustainable tourism, and it became the first-ever farm gate on the island 26 years ago. 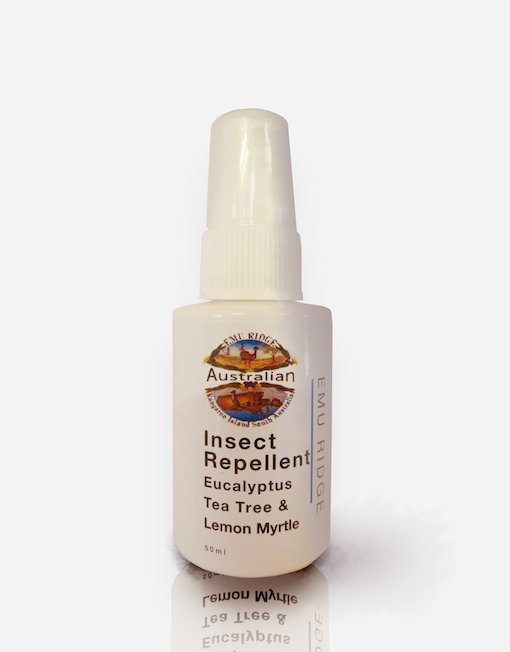 The judges said that this distinctly Kangaroo Island business provides a most comprehensive range of interesting products; that their DVD presentation works very well for visitors; and the availability of the DVD and printed items in many other languages was excellent. Staff and owners provided an excellent welcome and “a very good explanation of all products and services”. 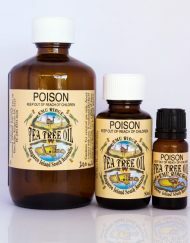 The business is working towards environmental sustainability, land management and re-vegetation, while producing 100 per cent pure eucalyptus oil from the Narrow Leaf Mallee (Eucalyptus Cneorifolia), which is only found on the island. There are “very good processes in place to conserve water and energy, also good full use of all by-product”. On-line subscribers are treated to regular newsletters and offers, so the farm gate experience continues long after visitors have returned to their homes. We thank Sealink who were the Farmgate Experience Category Sponsor . Sealinks Message – On Kangaroo Island, there’s a farm gate surprise around nearly every corner. That’s why we continue to love bringing visitors to the island, and helping them to see, taste, feel and experience the wonder and amazement of this incredible island. Over the past 28 years of operation, SeaLink has enjoyed seeing growth in the farm gate industry on Kangaroo Island and we are proud to have played a major role in bringing visitors to the doorsteps of these businesses. SeaLink looks forward to seeing continued growth and prosperity in the farm gate industry and we are proud sponsors of this award. 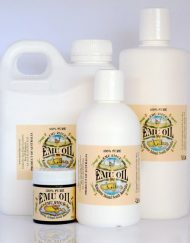 If your on Kangaroo Island don’t forget to visit us at Emu Ridge, and no matter where you are you can always buy our great pure natural Australian products online. Kangaroo Island Dining: Mercure Kangaroo Island Lodge. 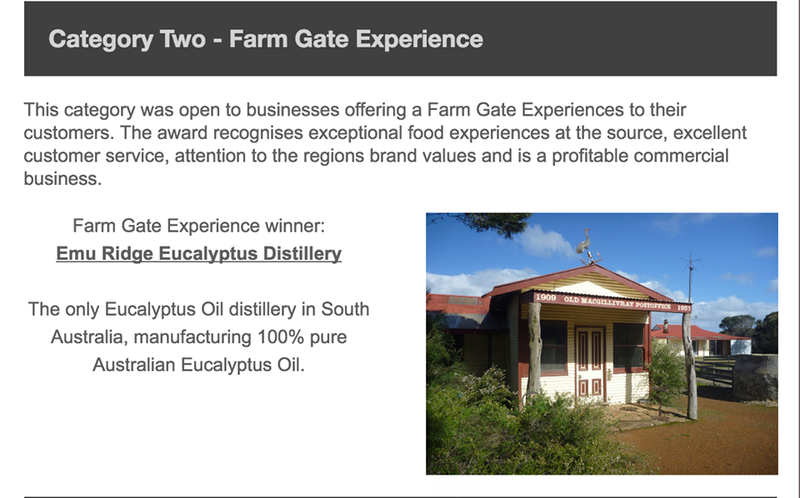 Farm Gate Experience: Emu Ridge Eucalyptus. Cellar Door Experience: Dudley Wines Cellar Door. Unique Food and Beverage Experience: Hannaford & Sachs. 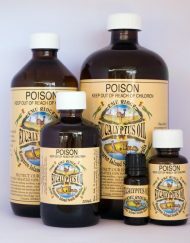 Business Development: Dudley Wines Cellar Door, KI Distillery. Nature-based Tourism Experience: KI Ocean Safari. Best Value-added Product: KI Shellfish – American River Snaptop Oysters. KI Outstanding Contribution by an Individual; Pierre Gregor and William August Boettcher (Augie). KI Wine of the Year: KI Trading Co – 2015 Shiraz.